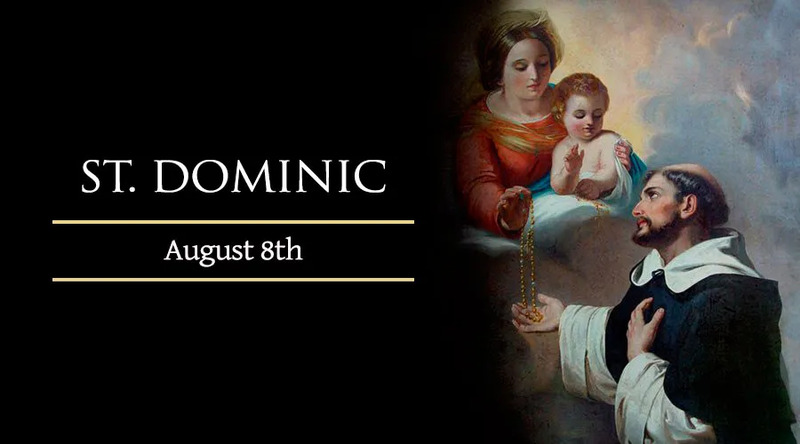 On Aug. 8, the Catholic Church celebrates the feast day of St. Dominic Guzman, who helped the cause of orthodoxy in the medieval Church by founding the Order of Preachers, also known as Dominicans. Born in Caleruega, Spain around the year 1170, Dominic was the son of Felix Guzman and Joanna of Aza, members of the nobility. His mother would eventually be beatified by the Church, as would his brother Manes who became a Dominican. The family's oldest son Antonio also became a priest. Dominic received his early education from his uncle, who was a priest, before entering the University of Palencia where he studied for ten years. In one notable incident from this period, he sold his entire collection of rare books to provide for the relief of the poor in the city. After his ordination to the priesthood, Dominic was asked by Bishop Diego of Osma to participate in local church reforms. He spent nine years in Osma, pursuing a life of intense prayer, before being called to accompany the bishop on a piece of business for King Alfonso IX of Castile in 1203. While traveling in France with the bishop, Dominic observed the bad effects of the Albigensian heresy, which had taken hold in southern France during the preceding century. The sect revived an earlier heresy, Manicheanism, which condemned the material world as an evil realm not created by God. Dreading the spread of heresy, Dominic began to think about founding a religious order to promote the truth. In 1204 he and Bishop Diego were sent by Pope Innocent III to assist in the effort against the Albigensians, which eventually involved both military force and theological persuasion. In France, Dominic engaged in doctrinal debates and set up a convent whose rule would eventually become a template for the life of female Dominicans. He continued his preaching mission from 1208 to 1215, during the intensification of the military effort against the Albigensians. In 1214, Dominic's extreme physical asceticism caused him to fall into a coma, during which the Virgin Mary is said to have appeared to him and instructed him to promote the prayer of the Rosary. Its focus on the incarnation and life of Christ directly countered the Albigensian attitude towards matter as evil. During that same year, Dominic returned to Tolouse and obtained the bishop's approval of his plan for an order dedicated to preaching. He and a group of followers gained local recognition as a religious congregation, and Dominic accompanied Tolouse's bishop to Rome for an ecumenical council in 1215. The council stressed the Church's need for better preaching, but also set up a barrier to the institution of new religious orders. Dominic, however, obtained papal approval for his plan in 1216, and was named as the Pope's chief theologian. The Order of Preachers expanded in Europe with papal help in 1218. The founder spent the last several years of his life building up the order and continuing his preaching missions, during which he is said to have converted some 100,000 people. After several weeks of illness, St. Dominic died in Italy on August 6, 1221. He was canonized in 1234 by Pope Gregory IX.